HOUSTON — (September 10, 2014) — Summer wrapped up on a high note for the Houston real estate market, as August delivered gains in both sales volume and prices. Housing inventory held steady month-over-month, but is tracking slightly below year-ago levels. While prices were the highest for an August, they fell short of the all-time records set in June. Single-family home sales totaled 7,505 units, up 1.1 percent versus August 2013, according to the latest monthly report prepared by the Houston Association of Realtors (HAR). Months of inventory, which estimates how long it will take to deplete current active housing inventory based on the previous 12 months of sales activity, matched Julys 3.0-months supply, but was down slightly compared to the 3.3-months supply of last August. It is significantly below the current national supply of 5.5 months of inventory. The average price of a single-family home rose 6.4 percent year-over-year to $275,369. The median pricethe figure at which half the homes sold for more and half for lessjumped 10.4 percent to $206,000. August sales of all property types totaled 8,953 units, a 1.7-percent increase compared to the same month last year. Total dollar volume for properties sold rose 6.8 percent to $2.3 billion versus $2.2 billion a year earlier. In its September 2014 Economy at a Glance report, the Greater Houston Partnership stated that the Houston metropolitan area created 112,200 jobs in the 12 months ending July 2014, which represents a 4.0 percent annual growth rate. That puts Houston ahead of the nations major metros for job growth, ahead of Dallas-Ft. Worth (3.9 percent) and Miami (3.3 percent). The Houston housing market saw growth in all measurement categories in August, with total property sales, total dollar volume and average and median pricing all up when compared to August of 2013. Month-end pending sales for all property types totaled 4,360. That is statistically flat compared to last year and may potentially signal a slowdown in sales activity when the September numbers are tallied. Active listings, or the number of available properties, at the end of August was 29,574 and is 9.9 percent lower than last year. Houstons housing inventory, while slightly lower on a year-to-year basis, has held steady at a 3.0-months supply since July. It is down from the 3.3-months supply of August 2013 and below the current 5.5-months supply of inventory across the U.S. reported by the National Association of Realtors. 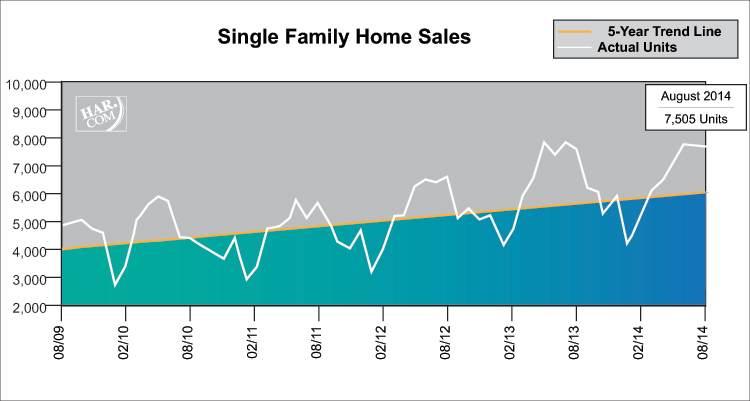 August single-family home sales totaled 7,505. That is up 1.1 percent from August 2013 and represents the third highest one-month sales volume of the year. Home prices reached record high levels for an August. The single-family median price jumped 10.4 percent from last year to $206,000 and the average price rose 6.4 percent year-over-year to $275,369. Transactions overall closed at a near-record pace. The number of days a home took to sell¬, or Days on Market, was 46. In July it reached a record low of 45 days. 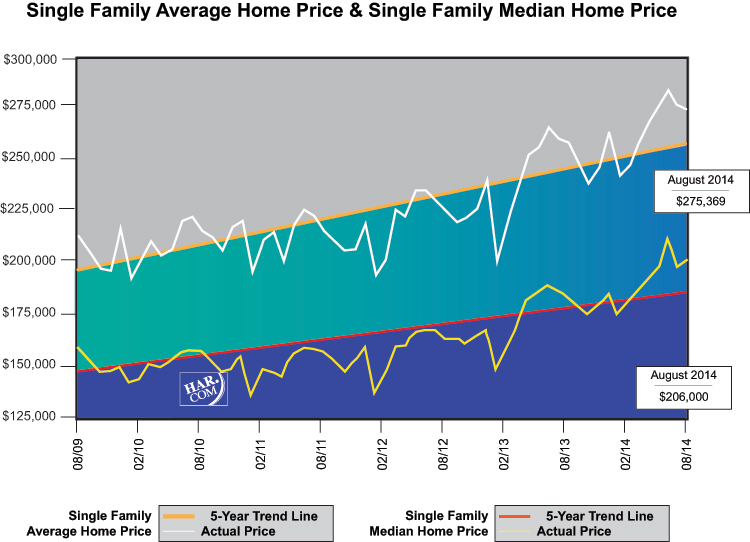 HAR also breaks out the sales performance of existing single-family homes for the Houston market. In August, existing home sales totaled 6,608. That is 0.2 percent ahead of the same month last year. The average sales price increased 5.7 percent year-over-year to $260,031 while the median sales price jumped 9.3 percent to $192,000. After a 3.1 percent year-over-year decline in July, sales of townhouses and condominiums edged up 1.1 percent in August versus one year earlier. A total of 663 units sold last month compared to 656 properties in August 2013. The average price declined 2.6 percent to $195,234 and the median price dropped 5.0 percent to $142,500. Inventory was down to a 2.6-months supply versus a 3.2-months supply a year earlier. Demand for lease properties remained strong in August. Single-family home rentals rose 8.8 percent compared to August 2013, while year-over-year townhouse/condominium rentals increased 1.7 percent. The average rent for a single-family home was up 4.8 percent to $1,830 and the average rent for a townhouse/condominium rose 5.2 percent to $1,584. Rentals of single-family homes rose 8.8 percent year-over-year and the cost of renting those homes increased 4.8 percent to $1,830. Townhouse/condominium rentals edged up 1.7 percent, with rents rising 5.2 percent to $1,584. The computerized Multiple Listing Service of the Houston Association of REALTORS® includes residential properties and new homes listed by 27,000 REALTORS® throughout Harris, Fort Bend and Montgomery counties, as well as parts of Brazoria, Galveston, Waller and Wharton counties. Residential home sales statistics as well as listing information for more than 50,000 properties may be found on the Internet at https://www.har.com. Founded in 1918, the Houston Association of REALTORS® (HAR) is a 27,000-member organization of real estate professionals engaged in every aspect of the industry, including residential and commercial sales and leasing, appraisal, property management and counseling. It is the largest individual dues-paying membership trade association in Houston as well as the second largest local association/board of REALTORS® in the United States.